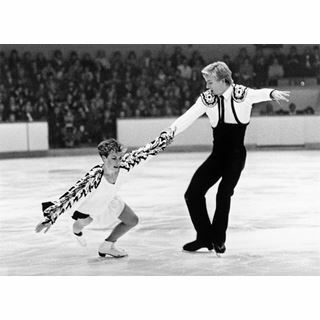 photographer Forman, T Bailey Ltd.
Torvill and Dean were World Champion ice-dancers both hailing from Nottingham. They won many awards, including coming first in both European and World Skating Championships. The most famous was when they won the Gold medal at the 1984 Olympics in Bosnia, with a ground breaking perfect score of 6.0 for their interpretation of 'Bolero'. They were made Honorary Freemen of the City of Nottingham in April 1983 and have streets named after them in a housing estate in Bilborough.